Deb's Cup of Tea: Forget the Robin. This is the Official Start of Spring. Forget the Robin. This is the Official Start of Spring. 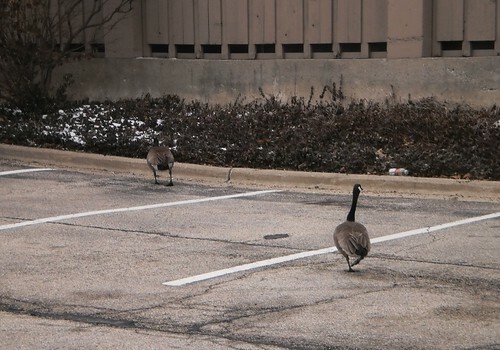 They were in the parking lot yesterday morning. About three years ago, a pair made a nest in the embankment near the front door. They never hatched any of the 5 eggs she laid. Robins can come back too early but when the geese start checking out nesting sites, you know spring is around the corner. "What do you think of this spot, Herbert?" "Nah. There's some woman with a camera. Let's find a more secluded spot."